The ancient and religious city of Nashik is located around 165 km from Mumbai. It is popular for hosting one of the biggest Kumbh Mela festival once every 12 years. Apart from its religious significance, Nashik also has the best produce of vegetables and fruits, especially grape vineyards. So it is a great destination for some fine wine tasting! According to a legend, Gods and Demons fought for a pot of nectar that was supposedly immortal. The fight led to spillage of this nectar in four different regions of India, of which one is the banks of river Godavari in Nashik. "Kumbh" is believed to be the word derived from this pot. Therefore, Kumbh Mela is celebrated in such grandeur every 12 years. The time between October to March is perfect to visit Nashik, when the weather is pleasant and salubrious. Summer is extremely hot in Nashik with temperature soaring to almost 50 Degree Celsius. Read further to know about the places to visit on the way to the religious city of Nashik. Thane and Kalyan are the two cities you will reach once you leave Mumbai. Located at a distance of 22 km and 45 km respectively from Mumbai, there are a number of places to visit in these cities. Upvan Lake and Amusement parks like Tikuji Ni Wadi and Sanjay Water Park are Thane's prime attractions. Kala Talao Lake and Durgadi temple are the two popular places of interest in Kalyan. Located at a distance of about 48 km, Mahuli is a haven for trekkers and rock climbers, because of the innumerable peaks spread across the place. It is a group of a few hills which have common summits. The Mahuli Fort is settled at an elevation of 2,815 ft, and was built by the Mughals. It is Thane's highest point and therefore it is a sought after location for trekkers from Mumbai and Thane. Igatpuri is a beautiful hill station, with a number of intriguing places to visit. It is located about 58 km from Mahuli Fort. Igatpuri is packed with trekking places like hike to the Kalsubai Peak, Tringalwadi Fort and Kulangad trek. Apart from pinnacles that offer breathtaking panoramic view of the entire place, Igatpuri is home to valleys like Bhatsa River Valley and Camel Valley. Read further to know about the places to visit in and around Nashik. 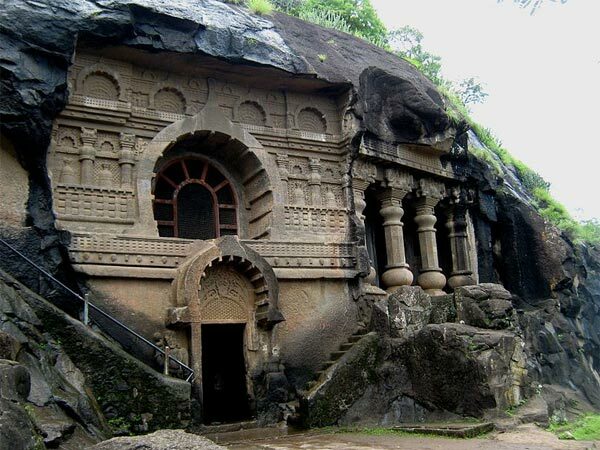 The Pandavleni Caves is a religious Buddhist site, which is a group of 24 carved caves, that represent Hinayana Buddhist caves. It was carved right from 2nd century BCE to 5th century CE by Buddhist monks, as a donation for Buddhist monks. Except for the 18th cave, most of the other caves are Viharas or Buddhist monasteries. The 18th cave however, is a Chaitya or a prayer hall. Inscriptions made by different dynasties that ruled Nashik can be seen on the walls of these caves. The caves remain open from 8.30 AM to 5.30 PM everyday. Located about 28 km from Nashik city centre, Trimbakeshwar Temple is a regal Hindu temple dedicated to Lord Shiva. It is also one among the 12 Jyothirlingas of India. The Jyothirlinga shrines are believed to be those where Lord Shiva appeared as a fierce column of light. Nestled between the three hills of Brahmagiri, Kalagiri and Nilagiri, the temple has three shrines representing Lord Brahma, Vishnu and Shiva. Muktidham is a beautiful temple complex founded in the year 1971. It is made mostly out of marble stone. It houses shrines of various Hindu Gods along with replicas of the 12 Jyothirlingas, which have been consecrated holy by sending each idols to its respective site of pilgrimage. Idols of other Hindu Gods such as Lord Krishna, Ganesha, Vishnu, Goddess Durga, etc., are also present in this temple complex. Nashik is a religious site with numerous temples, making it a must-visit site of pilgrimage. Saptashrungi is a popular holy temple located almost 60 km from Nashik. It is perched on a hill range of 7 seven hills, which is how the temple derived its name (Sapta means seven while Shrung means peak). Kalaram Temple, Kapileshwara Temple and Jain Temple are some of the other places that have to visited when in Nashik. Apart from temples, Ramkund is the site where Kumbh Mela takes place every 12 years. Apart from temples, Nashik is known for growing fantastic vineyards. Sula Vineyards was India's first commercial vineyard, that has varieties of vines such as Riesling, Chenin Blanc, Zinfandel, etc. It also has a winery so don't miss out on tasting some brilliant wine!